Platinum is relatively scarce with only a few hundred tons produced each year and most of that production is used for industrial purposes making it an extremely valuable precious metal. The Platinum American Eagle is the official platinum bullion coin of the United States and was first release in 1997. The coin is backed by the United States government and is authorized by the United States Congress. The 1 oz version of the Platinum American Eagle is produced with .9995 fine platinum. The 1 oz Platinum American Eagle has a nominal face value of $100 is considered legal tender of the United States. The obverse of the coin features the John Mercanti design of a forward-looking Lady Liberty. LIBERTY is directly above the crown of Lady Libery with the year of issue and IN GOD WE TRUST to the right of Lady Liberty. The reverse of the coin features a bald eagle with wings extended outward revealing a truly impressive wingspan. The eagle is flying with mouth open away from the sun and its rays that are below and to the left of the eagle. The reverse also includes UNITED STATES OF AMERICA, the coins nominal value of $100, as well as the weight and fineness of the coin. The Platinum American Eagle is one of the most popular platinum coins in the world and is the only investment grade platinum coin produced by the U.S. Mint. The Platinum American Eagle also boasts a face value of $100, the highest of any coin ever minted in the United States. 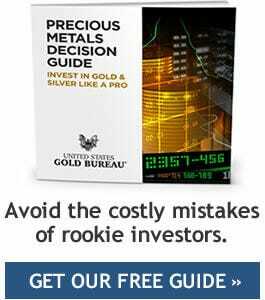 Precious metals investors looking to further diversity their portfolios need to look no further than the 2019 Platinum American Eagle available at the U.S. Gold Bureau.